Mary first opened the studio in 1980 and is very proud of the growth and success of the studio and the students. She is certified to teach dance through Dance Educators of America and continues to study with frequent trips to New York as well as many dance conventions a year. Mary is trained in the Russian and Checchetti forms of ballet as well as jazz, lyrical, tap, modern, and ethnic dance. As a teacher Mary believes that students learn the best when they know they are important and loved! Mary has been teaching dance for over 30 years, was the former Ballet Mistress of the Detroit City Ballet Company, has choreographed award winning dances, won choreography awards, judges dance competitions and also works with the schools in the state to choreograph musicals and choir groups. The studio is known for its family atmosphere and the desire to keep dance affordable for all families. Mary teaches all levels and ages and loves that her passion is also her job! Mary and her husband Ed are the proud grandparents of their favorite dancers Julia and Gracie, as well as their grandson Jack. ​Stacey grew up in the studio and has studied all forms of dance. Stacey has a BS in elementary education from Oakland University and a Masters in Teaching from Marygrove College. In addition to teaching at the studio, Stacey is an elementary teacher for Chippewa Valley Schools. 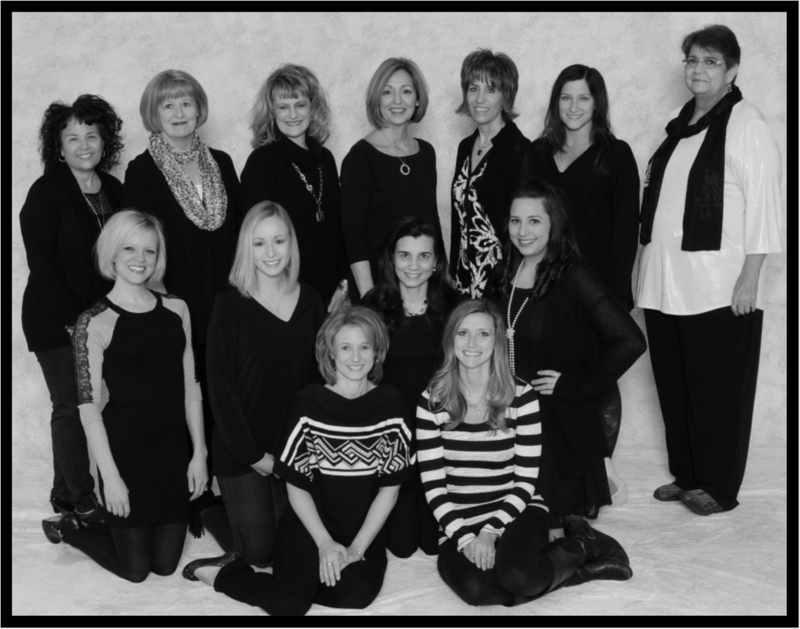 As the director of the Mary Skiba Competition Team, Stacey has brought great pride and success to the studio with her award winning dancers and choreography. She has received many awards for outstanding choreography and has choreographed many routines that have won Overall High Score awards at several competitions. Stacey is a teacher that motivates through her love of dance and love of her students and emphasizes the importance of training in all styles so her students can take their talents into college level programs and the professional world! Stacey and her husband Mark are the proud parents of Julia, Gracie and Jack. Jacki has been with MSSD since 1985 and has been teaching for the past 20 years. She holds a Bachelor of Arts degree in dance from Oakland University and was a former member of the Oakland University Dance Company. She has participated in the American College Dance Festival and was a scholarship recipient during college. Jacki teaches all levels of dance and all styles of dance, but she is known for her work with our younger dancers due to her ever present smile and happy outlook on life. Jacki has also taken on the responsibility of helping us organize our costumes and recitals and her efforts help our studio have smooth and safe shows for our dancers. Jacki and her husband Steve are the proud parents of Justin. ​Marcus joined our studio in 2007 to assist with our competition team and we quickly added him to our teaching staff to work with all of our dancers. Marcus has studied all forms of dance but specializes in lyrical, jazz, modern, and hip hop. As a student Marcus has competed at the National level and has won numerous awards for his dancing. As a teacher Marcus has choreographed many award winning routines and is a favorite with our dancers. In addition to his love for dance Marcus is a gifted interior designer and owns Marcus Allen Designs. Marcus is a favorite with our dancers due to his high energy and love of dance. Florie has been with MSSD for the past 20 years. She holds a Bachelor of Arts degree in Dance and French from Oakland University and also works for Lake Orion Schools teaching dance to elementary students. Florie has participated in the American College Dance Festival and was a scholarship recipient during college. She was also a member of the Oakland University Dance Company and Nonce Dance Ensemble, a professional modern company and has also been active in the Ms. America Pageant system – competing twice for the title of Ms. Michigan! Florie is a teacher that gives of her time and talent to her students and is the founder of our acro program which continues to grow each year. Despite working 2 jobs, Florie is always willing to stay late or come in early to work with any student and gives of her time with love to all of her students. Florie and her husband Mike are the proud parents of Mario, Gino and Lena. Kelli has been dancing since she was a young child and has a great deal of experience in competitive dance having won several National Overall High Score awards. Kelli works with our competition team and our recreational students in Lyrical, Jazz, Modern, and Acro. Her students have been very successful in competitions and have won numerous awards at the regional and national level. The students love Kelli because she has a love of dance and a love of dancers. Kelli attends many dance conventions during the year to keep current on the latest trends in dance and also studies in New York. Kelli and her husband Ryan are the proud parents of Chase and Rheagan. Laura has been with Mary Skiba's School of Dance since it first opened and has taught all forms of dance and to all levels of students. Laura has a BA from Oakland University in Dance where she was awarded a full scholarship and was a former dancer with the Oakland University Dance Company. Laura has danced with the American College Dance Festival and has taken classes with some of the leading choreographers and teachers in the country. Laura continues to enhance her training by attending dance conventions and taking classes in New York and Chicago to provide her students with new and innovative techniques and choreography. Laura is a favorite among the students and is a wonderful role model for all of the MSSD students. Laura and her husband Mike are the proud parents of Caitlyn and Brandon. Michele has been with MSSD since it first opened and has taught at the studio for over 20 years. Michele also works with our competition team and is the director of our Musical Theatre program. Michele holds a BS from Western Michigan University and a Masters Degree in Communications from The University of Georgia. Michele is trained in all forms of dance and is the leading force in the strength and conditioning training of our students. Michele is a certified Zumba instructor and is the owner of StudioFiT. Her high energy and enthusiasm is a motivator for all of her students. Michele and her husband David are the proud parents of Zachary and Mackenzie. JoAnn holds a BFA from Marygrove College in Dance, and a Masters Degree in Administration. Although her full time job is that of Vice President at Marygrove College; JoAnn never sits still! She teaches Advanced Ballet at the studio, directs the children for the annual productions of The Nutcracker at The Detroit Opera House, directs the flag corps for DeLasalle High School, choreographs for the DeLasalle Show Choir, and choreographs many musical productions in the Detroit area. In addition to her dance training, JoAnn also holds a certificate in Dance Therapy from the Royal Academy in London England where she studied for a year after graduating from college. JoAnn has a wealth of experience in ballet and is well versed in all methods of ballet which brings a unique level of knowledge to our dancers. JoAnn is loved by the students for her high energy, wonderful analogies, and dedication to her students training. We are lucky to have her among our staff! JoAnn and her husband Omar are the proud parents of Jaclyn and Jennifer, grandmother to Mason and Emmitt and the sister of Mary Skiba! ​Jill has been with the studio since she was a young girl and also competed with the studio and won a top overall score at her very first competition! Jill works with all levels and teaches all styles of dance, but her emphasis is on ballet. As a young dancer, Jill was selected to perform the role of Clara in The Nutcracker and continues to be a beautiful ballet dancer. Jill is soft spoken, but a tough technician in all of her classes. She is loved by the students for her enthusiasm and beautiful choreography. Jill is often found at our dance competition to assist our dancers and our staff. Jill continues to study at conventions and with master ballet teachers and we are very fortunate to have her work with our students. Jill and her husband Brent are the proud parents of Grant and Faith. ​“Ms Sam” has been with the studio since she was a young child and has studied all forms of dance. Besides teaching at the studio, Sam is a licensed cosmetologist and works full time at the Lisa Renee Salon in Macomb Township. Sam has been a teacher at the studio for the past 8 years and has taken several trips to New York to attend classes at The Broadway Dance Center. You will also see Sam at every competition our students attend to cheer us on and to help our students in whatever they may need. Sam is loved by our students and our staff for her dedication, energy, and loving heart! Sam’s parents also build the scenery for our recitals and MSSD is lucky to have the Mostiller family in our family! Alyssa is a founding member of the MSSD Competition Team. As a competitor Alyssa won numerous overall awards and traveled the country attending various Intensives. Alyssa's award winning groups have brought tremendous pride to MSSD. Alyssa currently attends Wayne State University as a graduate student in the School of Pharmacy. When Alyssa isn't studying, or teaching she loves cheering on her sister Jenna at all our competitions. Tara is a graduating member of the MSSD Competition Team. As a dancer Tara found tremendous success taking the National Teen Performer of the Year award at LA Dance Magic, in addition to numerous overall awards. Tara has performed with SuMO, and assists notable choreographers on the convention circuit. Tara's love for teaching, inspiring and challenging dancers makes her a wonderful addition to our teaching staff. Alicia has trained at the studio since the age of three in all forms of dance. During her years as a student she danced competitively as a member of our Mary Skiba Competition Team. In addition to teaching at the studio Alicia is a graduate of Wayne State University with a degree in secondary education with a focus in English. Alicia is a valued member of our staff! Natalie has spent her years as a dancer at Mary Skiba School of Dance. She has trained in all forms of dance and spent ten years dancing competitively in our program. Since graduating in 2015 Natalie has begun her nursing degree at Oakland University while teaching at the studio. Natalie not only teaches our recreational students but also assists with the competitive program. Natalie has affectionately been called the "team mom", due to her amazing ability to help anyone at anytime. This quality makes her a wonderful asset to MSSD. Irene Vandenberghe is a founding member of our MSSD Competition team. As a competitor Irene won numerous overall awards, danced as a member of the LA Dance Magic Company, trained at the Summer Joffrey Intensive, and performed with Rapture Dance Project's production of City Lights. Irene is a graduate of the University of Michigan with a Bachelors of Arts in Dance. When Irene isn't performing or teaching she can be found supporting her favorite MSSD dancer Ava.